4-6 ENLISTED QUALIFICATIONS HISTORY The Enlisted Qualifications History, NAVPERS 1070/604, is page 4 of the service record. The initial page 4 is prepared by the classification section at the Military Entrance Processing Station (MEPS). This form is a permanent part of your enlisted service record and accompanies you throughout your active-duty or inactive-duty career. Subsequent page 4s are prepared by your command after a section becomes filled with entries. The page 4 has a wealth of information that is of considerable value to you and the Navy. It includes but is not limited to the following: 1. Education experience level (highest grade completed, General Education Development [GED]). See figure 4-6, section 1. 2. 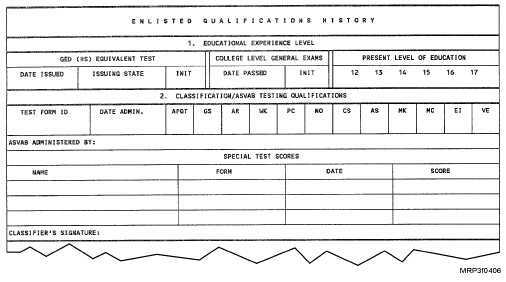 Classification/Armed Services Vocational Aptitude Battery (ASVAB) testing qualifications (This section is to be completed by enlisted classifiers only.). See figure 4-6, section 2. 3. Off-duty education/non-required Navy correspondence courses (Scholastic Aptitude Test [SAT], American College Test [ACT] scores). See figure 4-7, section 3. 4. Training courses (courses qualifying the member to operate or maintain specific types of equipment). See figure 4-7, section 4. 5. Navy service schools/military training courses. See figure 4-8, section 5. 6. Correspondence courses required for advancement. See figure 4-8, section 6. 7. Navy Enlisted Classifications (NEC) codes. See figure 4-9, section 7. 8. Personnel advancement requirements. See figure 4-9, section 8. 9. Rate advancements. See figure 4-9, section 9. 10. Designators (special warfare, etc.). See figure 4-9, section 10. 11. Awards (personal military decorations and unit awards). See figure 4-10, section 11. 12. Personnel Qualification Standards (PQS). See figure 4-11, section 12. When you reenlist, a new NAVPERS 1070/604 is prepared for the Field Service Record. A copy of all previously completed page 4s will be maintained in the Field Service Record (right side). All originals are forwarded to the Bureau of Naval Personnel for inclusion in your permanent service record. Figure 4-6.Enlisted Qualifications History (page 4), NAVPERS 1070/604, Sections 1-2.